It is interesting to note that an attractive, relatively new, brand for men’s underwear and nightwear has been devised by a woman. 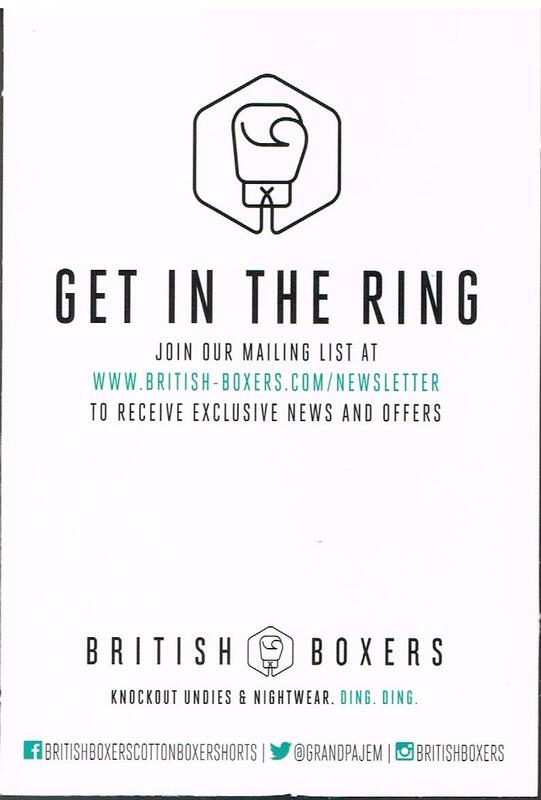 Deb Price set up British Boxers in 2012 with the aim of “bringing a traditional product to a whole new generation”. That key traditional product is boxers shorts, now augmented by jersey trunks, pyjamas, dressing gowns and socks. Deb Price has good experience in the area, having been head of buying at long-established nightwear producer Bonsoir for several years after a career with high-street retailers. Having studied textiles and fashion in Manchester in the early 1990s, she has been able to blend her training and professional experience to create British Boxers. Most of her sales is done through the website although she is very pleased to be stocked by Harrods. 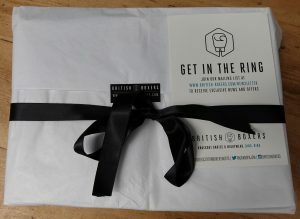 When Deb contacted me and sent me a selection of her goods, I was impressed by the presentation, packaging and branding. The link with boxing is neatly done and is relevant to Deb, who tells me she is the great, great, great granddaughter of Jem Mace (1831-1910), a celebrated pugilist who spanned the bare knuckle and gloved eras. I did warn Deb that I was not a fan of boxer shorts, but she sent me two pairs anyway. Having given them a test run, I can confirm hers are in comfy 100% two-fold cotton, nicely made and in attractive colours or stripes. They are £22 a pair, £44 for a two-pack. 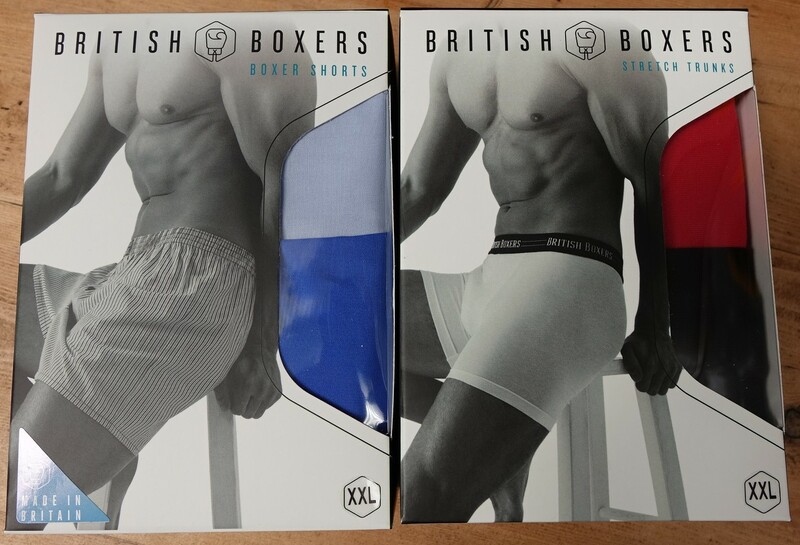 Of their type, these are fine, but I still do not like the loose-fit, the excess fabric and the relatively lack of support that is the characteristic of the boxer short, but I am sure these would please boxer short fans. Much more to my personal taste are the trunks, which are in a 95/5 cotton/elastane blend that gives a soft but snug supporting fit. 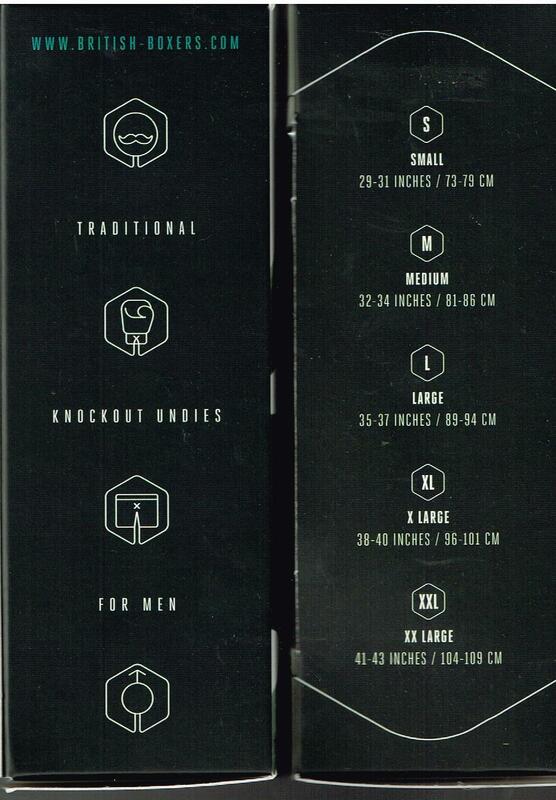 My only criticism is that they (like the boxer shorts) have a relatively low rise – the measurement from crotch to waistband – which does not sit well with my belly. But that, arguably, is my problem! The trunks are £18 each or £34 for a two-pack. I like them, not least because the colour selection has more than just the usual options. The big surprise in Deb’s box to me was the brilliant striped cotton dressing gown. 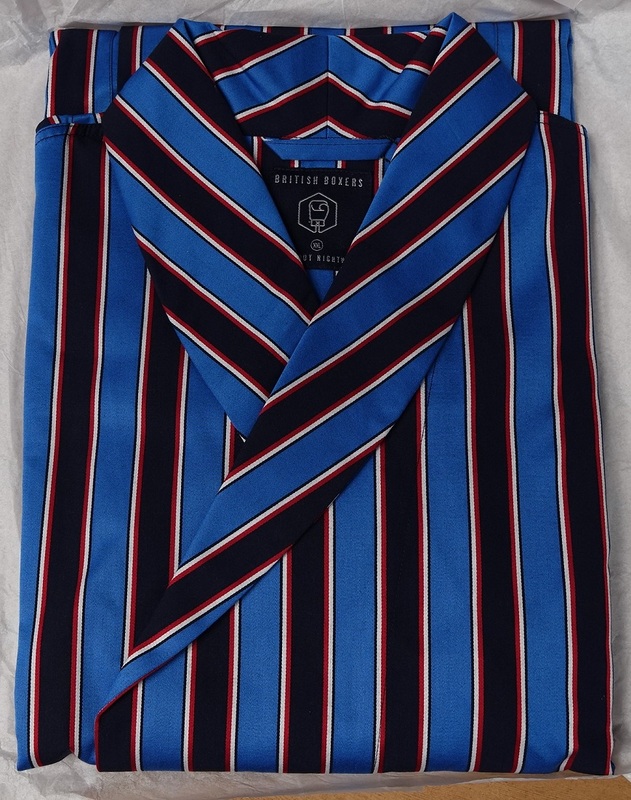 It is beautifully made, with the matching of the stripes showing the attention to detail. 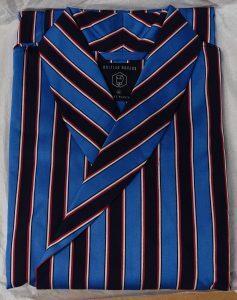 It is a very practical calf length and it is altogether much smarter than it looks in the image from the website I reproduce here (my bold blue stripe version is not on the site at the time of posting). 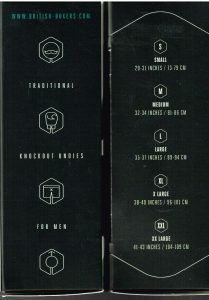 As well as the exterior belt, the robe has two inner ties to create a snug fit. The robe costs £89 and is of a weight that will make it ideal for wear all-year round. Deb Price, who is based in Leek, Staffordshire, has her boxers made locally to home, while her briefs up to now have been made in the East Midlands near Leicester, as are her socks (£14 a pair). But she has hit frustrating manufacturing problems on the briefs (she has used seven UK factories trying to get the quality at the right price!) and is currently looking towards the Czech Republic for production. Those excellent dressing gowns are already made in Prague. 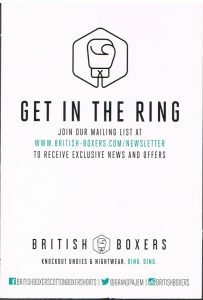 Sitting in the premium menswear sector, British Boxers is definitely worth a look. Beware, however, that putting on the underwear will not give you a physique like the model in the images! Good look to Deb and her team. This is a job well done.